It’s been a number of years since I first read The God of Small Things, and in order to write this review, I had to flick through a few pages to reacquaint myself with the story. After choosing a few pages at random, I soon found myself lost in the magical world that Arundhati Roy has created, and an hour passed before I surfaced for air. The opening paragraphs set an amazing scene; Roy’s ability to capture the everyday so profoundly is evident throughout the entire story. The reader is captured and consumed by her descriptive passages – it is too easy to imagine the scenes as they unfold, given Roy’s astounding skill at awakening every sense, so we smell, see, hear, touch and taste everything the characters smell, see, hear, touch and taste. The nights are clear but suffused with sloth and sullen expectation. The God of Small Things is a little bit magical. Roy has created a reality that is unlike any I’ve read before – it is beautiful, painful, exquisite and yet far more real than any other novel I’ve read. Jason Cowley (The Times) is quoted on the dust cover of my copy as saying, “She has a heightened awareness of the natural world, of smells and sounds, of colour and light…” and I think he has captured the writer perfectly. Her gift to weave such a tale rewards the reader with something like a sensory explosion – Roy manages to capture life and the mostly mundane in the most sensationally poetic way. She subscribed wholeheartedly to the commonly held view that a married daughter had no position in her parents’ home. As for a divorced daughter – according to Baby Kochamma, she had no position anywhere at all. And as for a divorced daughter from a love marriage, well, words could not describe Baby Kochamma’s outrage. As for a divorced daughter from an intercommunity love marriage – Baby Kochamma chose to remain quiveringly silent on the subject. 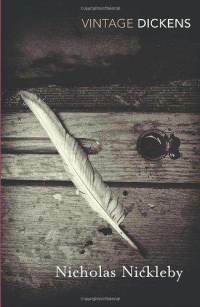 The God of Small Things is a novel about love, life and death. It is about relationships and the unseen, intangible forces that draw two people together, as well as the bonds within and between a family. It is about forbidden love and consequences, about society and class. All of these themes are weaved through a beautiful, poignant tale, forming a novel that is nearly impossible to put down. A highly recommended, unforgettable read. 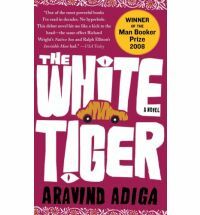 The White Tiger is the winner of the 2008 Man Booker Prize, and was easily the most enjoyable Booker that I have read to date. It is also the third Booker set in India or about Indians which I have read; the other two being In A Free State which has a story about an Indian manservant in the US, and The Siege of Krishnapur which is set during the Indian Mutiny. This book is set in modern India, starting out in Laxmangarh, moving briefly to Dhanbad then through to Delhi and finally resolving in Bangalore. It follows the life of Balram Halwai, also known as the white tiger. Balram is the son of a rickshaw puller, whose father wants him to be the first in the family to get an education. Sadly for Balram he does not get to remain in school, and considers himself to be half-baked because of it. The story is told in the form of a conversational letter written by Balram to the soon to be visiting Premier of China, Wen Jiabao. Balram recounts his life from Laxmangarh to Bangalore and how he is a great example of an Indian entrepreneur. The humour is all pervasive. All the way through the book the descriptions and language are full of it. But it isn’t straightforward humour, it is the sort that is full of very large porcupine quills. From a distance it looks sleek, but get too close and it will poke you firmly in your soft bits. It is crammed full of social observations, and shows the dichotomy of country and city, rich and poor, and traditional ways versus technology driven modernisation. It was highly entertaining while being quite enlightening about the life of the crushingly poor of India. Social commentary in humorous form. The “other India” is a reference to those who do not dwell in the Darkness – the poor, rural communities where the landlords are rulers of all and decide just about everything. Then, a tongue in cheek commentary on the life of a city driver, which Balram becomes. You can develop the chauffeur’s habit – it’s a kind of yoga, really – of putting a finger in your nose and letting your mind go blank for hours (they should call it the ‘bored driver’s asana‘). And some irony to finish. The dreams of the rich, and the dreams of the poor – they never overlap, do they? Part of me feels badly about enjoying this so much. There is so much injustice, mistreatment and general dishonesty and nastiness described in this story that you really feel that you shouldn’t be enjoying it at all. You should be feeling some sort of ire, anger or horror. But you don’t. Maybe it’s the irrepressible way that Balram looks at life that allows you to read his story without wallowing in the misery of the lifestyle he describes. I really loved reading this. If you want to read a Booker this year, then choose this one. I don’t think you’ll be disappointed.